What is the definition of transmaterial? The title of the upcoming catalog sequel from Princeton Architectural Press has us asking a lot of great questions. Click Continue Reading for the full book review. From the author's web site we get a clue to the definition we seek: "new materials are transforming our physical environment"; it is a statement of fact that, unless further qualified, can encompass the entire history of in the profession of design. Yet to contemporary designers it is a process of transformation that many feel is accelerating, even if there isn't a great deal of data to back up that feeling. From the book in question we get only implications from phrases like this one: "several broad categories serve to elucidate current material transformations". A little fuzziness suits us just fine for an idea that is not yet fully formed or defined. But this is exactly the place where a good grammar editor would greatly benefit the conversation. Strictly speaking, materials do not transform, so the phrase is uncomfortably vague. Regular low-water or fast-cure concrete does not transform into any other kind of concrete because of the march of technological innovation. Once it pours, it only sets. We can infer that the author is saying that categories of materials are evolving, that the ideas, deployment, production capabilities, production possibilities, and of course technology are all evolving, growing, expanding, or transforming. But we would rather the author be more consise in these matters. Being the completists we are we must point out that as new materials, assemblies, and systems become commonly used in construction, others see their use wane. Whole bodies of knowledge lose their craftsman, and while basic knowledge may never disappear, the tricks of the trade become buried rapidly. We feel no nostalgia from this process, but we are looking for the catalog documenting these trades before they become forgotten. Further muddying the definition is the catalog of transmaterials presented. Some of the entries are nothing less than potentially revolutionary materials. Page 71, Maplex, superior performance medium- and high-density fiberboard, perfect for CNC milling, and with twice the bending and tensile strengths of birch plywood of the same thickness: this material practically begs Alvar Aalto or the Eames duo to be reincarnated and start experimenting anew. Yet some of them seem destined to go straight into MoMA's design department and nothing more. Page 74, Riddled, perforated wood and aluminum storage cupboard, designed by Steven Holl. While it has no metal hinges for the compartments, it simply looks like a model for a Steven Holl building, and it's what we call "furniture". While it's interesting and beautiful furniture, it's difficult to understand what it contributes to the world of transmaterials. In the latter example, the definition of transmaterial is like an architectural student's use of the word material. Students of design are still unpracticed in merging architectural abstraction with material sensuality, a merging that is the day to day struggle of a practicing design professional. True pleasure, derived from simple life experience, has not yet entered the equation, and so execution of design ideas is still an abstraction. All of the real world is simply categorized as "material", without differentiation between furnishing, materials, assembly process, millwork, fixtures, and so on. The concrete is not yet inseparable from the idea for its deployment. These kinds of transmaterials seem like curiosities only, first runs at the raw materials they are presented next to. 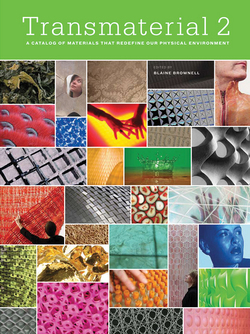 It is worth mentioning the organization of the catalog of transmaterials. The product pages are themselves helpful: there is basic information for all the transmaterials, including ASTM test numbers (where applicable) and contact information. It is the most useful guide out there for finding what is New Right Now in materials, short of the archaic subscription structure of Material Connexion (which we find too time consuming and expensive). The pictures are all clear and illustrative. The grouping of the materials is easy to follow, simple categories like concrete, wood, glass: the way most designers' materials libraries are organized. While we find the seven categories described in the introduction (ultraperforming, multidimensional, repurposed, recombinant, intelligent, transformational, and interfacial) much more helpful in understanding why these transmaterials were selected, the author has made the wise choice to use the more useful organization for the rest of the book. We must also discuss category number 5, the use of the term intelligent materials. The term has an unfortunate resonance to the phrase intelligent design: the religious argument, masquerading as scientific discourse, against the theory of evolution. This implies the need for a suspension of rational critique. Indeed the fascination the previous volume in this series, Transmaterial, had with digital design sometimes relied on this suspension of disbelief. Yet these implications are cleverly done away with (or at least appear to be on their way out), because in this instance the book makes its most powerful argument for transmaterials. Intelligent materials alter the environment in ways more than aesthetic: they participate in environmental conditions by purifying water and air, or creating energy from passive exposure to the sun. It seems to us that these are the true materials of the future, materials that go far beyond dealing with structural integrity, waterproofing, and architectural aesthetics, as most materials to date have done. These are the materials worth watching and exploring, because they take the profession into the realm of environmental curators. In addition to all the impacts designers have henceforth accounted for in our designs, we can add the environmental impact, on a global scale, to those professional considerations. Transmaterials have the potential to include all considerations at once. Green buildings will never again be macrame hammocks. I propose a very blunt yet open-ended definition for transmaterial: it is a way of approaching new materials in design. It is simply a clever label for a particular set of design interests. It is a brand perfectly suited for the Dwell/Wallpaper* set (where this stuff gets editorial coverage and advertisement space). This is not meant as pejorative, but as a way of delivering this stuff to a target audience, broadening the conversation about materials and design to clients and design enthusiasts, and opening the door for architects and interior designers to radically improve the well-being of the global environment. It's happening already, this will just make it easier. This book is available at Amazon .